So it's day 4 of Knitting and Crochet Blog Week 2011 and as a new knitter the topic "where are they now?" doesn't really apply to anything I've made yet, so I'm using the Wildcard topic today: Blog about an embellishment, be it a zipper, amigurumi eyes or appliqué patch which you are either saving to use or have in the past used to decorate a project with. 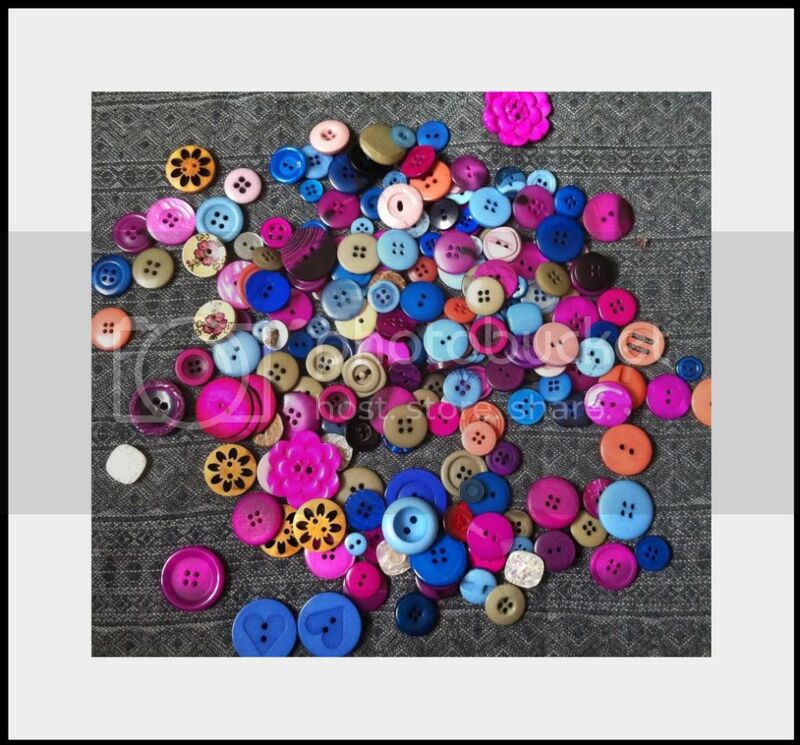 I've always loved buttons - my Nanna had a huge button tin (the huge type that come filled with enough chocolates for the whole family at Christmas) bursting with wonderful colourful buttons in all different shapes and sizes - wooden, plastic, horn, you name it - and I spent hours playing with them as a child. I liked the sounds they made when the tin was shaken (I did this a lot) and adored the way they felt when I pushed my little hand in and wiggled my fingers. In fact, I'm sitting here wondering what happened to that tin of buttons when she died - I must ask my mum... perhaps they are lurking in a cupboard somewhere waiting to be re-discovered...? Now I'm off to see what everyone else has written today - theirs will be tagged as 2KCBWDAY4 so you should be able to find them using your favourite search engine. Hope you have a lovely Thursday! Another button lover here too! I have loads left over from my papercrafting days when buttons featured heavily in my projects. Don't forget to rescue buttons from any clothing you might be throwing away! I really like the flower buttons in your photo. I only have the one shawl pin, but I can see a large collection growing from that one! I remember my gran's button tin too, it had a kitty on it! When I visited with dd recently I suggested she let her play with it, but she keeps them in a tupperware box now, I was sooo disappointed :( lol! Lol I think the button obsession goes hand in hand with the knitting obsession :) I've got a nice little button hoard as well. How fun buttons can be! There are so many cute ones out there. I like how your collection inspire your knitting projects.